30 - Second Registration. Signing up is easy and commitment-free. 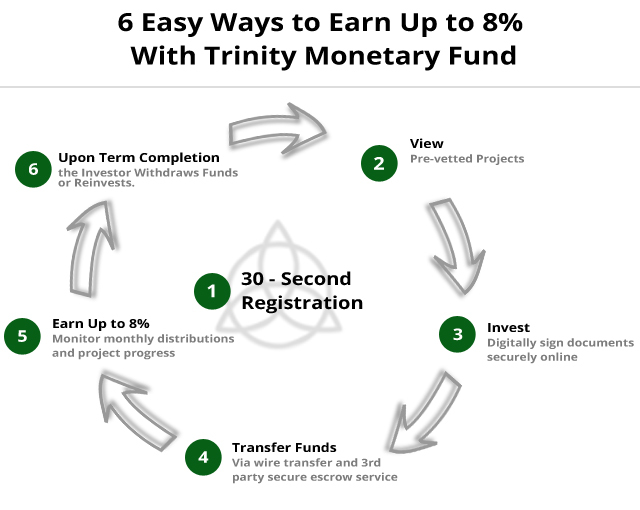 Once completed we will contact you to discuss investing in the Trinity Monetary Fund. Here we will see if we are your best option, answer any questions you may have, and begin the process. Digitally sign documents securely online Scan through our pre-screened Real Estate projects. You can view full financials, photos, appraisals, and documents related to that project all on one page. Invest. Click the "Invest Now" button on the Home page or anywhere else on the site. Go through 6 easy steps on secured website. Finalizing your investment process takes less than 10 minutes and we have streamlined the process to ensure future investments take half that. Seconds after completion of 6 easy steps you will receive emails. Transfer Funds. Pay for your investment via automatic bank wire. Accounts are secured by bank-level security measures and your investment information is stored on PCI-compliant, encrypted storage systems. Earn Up to 8%, Receive Monthly Distributions, and Monitor the Progress of Your Projects. Every month you receive a distribution directly into your account. Get real-time reports on all our current and past investments as well as the ability to reinvest your funds into new projects. Upon Term Completion, the Investor Withdraws Funds or Reinvests. The Investor completes the term and is now free to withdraw the initial loan amount along with any outstanding interest due, or to reinvest (refer to the PPM for further details). Lastly, you can download tax documents, your investment agreements and other files electronically. Disclaimer: This offering does not currently have open escrow. This investment process is for demonstration and review purposes only. This is not a real investment nor reservation. It is advisable not to provide any sensitive data in this review process. Do not transfer funds once the process is complete.